The book invites you in. 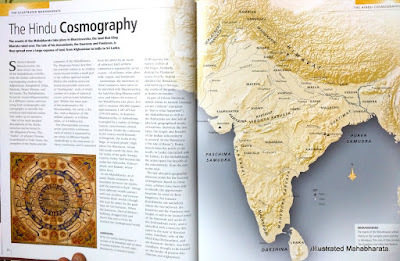 If you know the story, and scarcely anyone in India would not be familiar with the story in some or the other level of detail, you can dive into the book at any place. The start, the middle, the end. 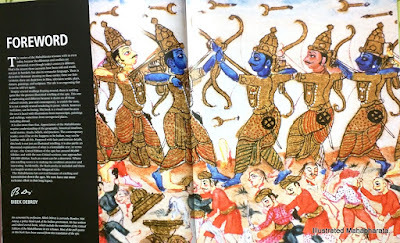 The Mahabharata is divided into 18 Parvas and an appendix - the Harivamsha. 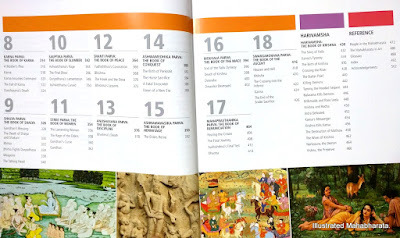 Fittingly enough, the book is also divided into eighteen chapters, and one un-numbered chapter, 'Harivamsha'. 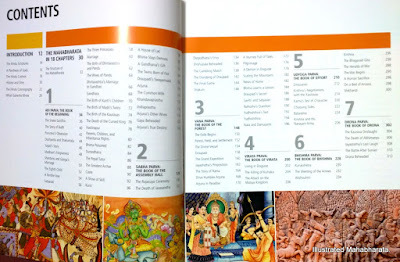 At over a hundred and twenty pages, the longest chapter is the first one, "Adi Parva", and appropriately so, since the Adi Parva contains a massive amount of information and stories that form the core of the Mahabharata over the remainder of the book. 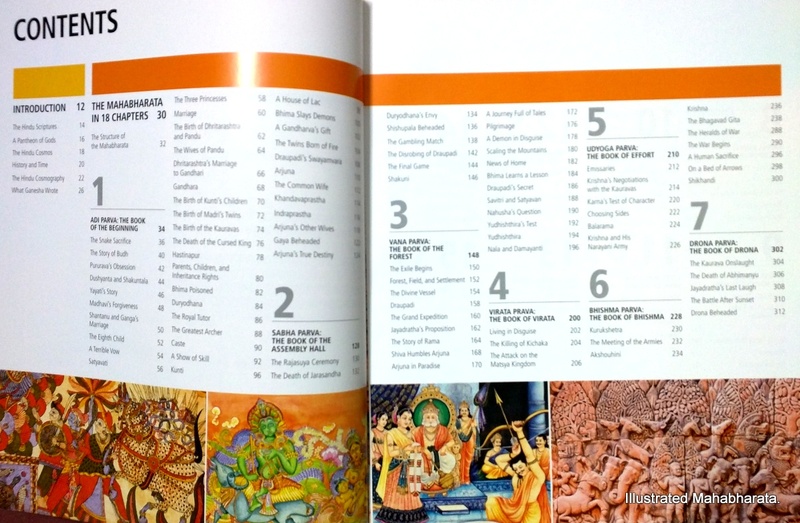 "Bhishma Parva", which contains the Bhagavad Gita, is the second-longest, with fifty pages devoted to the Gita. There are shlokas from the Gita written in the Devanagari script, with an English translation following. 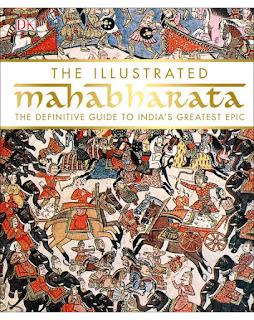 Each chapter provides a summary of the story, and is accompanied by hundreds of illustrations and photographs of paintings (of Raja Ravi Varma or Madhubani for instance), temple sculptures (from Angkor Wat for example), art, archaeology (of Painted Gray Ware associated with the Mahabharata period), geography (Dwarka and Kurukshetra), history, and more. 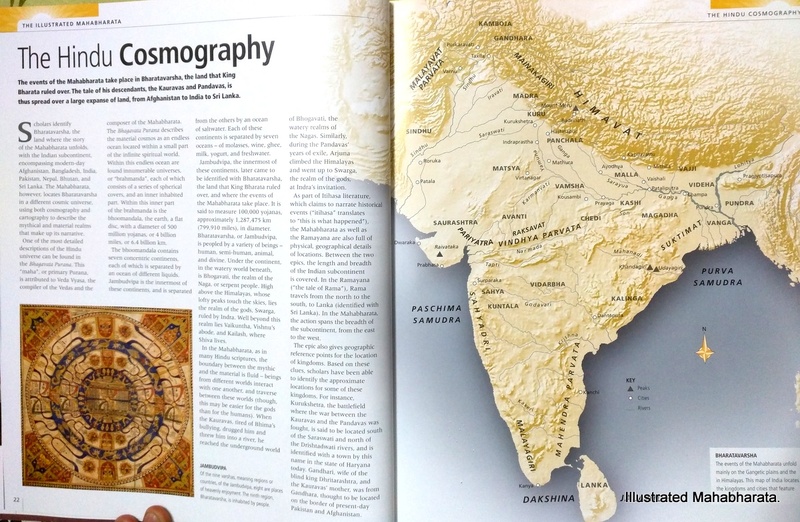 Where relevant, similarities between the Mahabharata and Greek mythology are also dwelt upon. 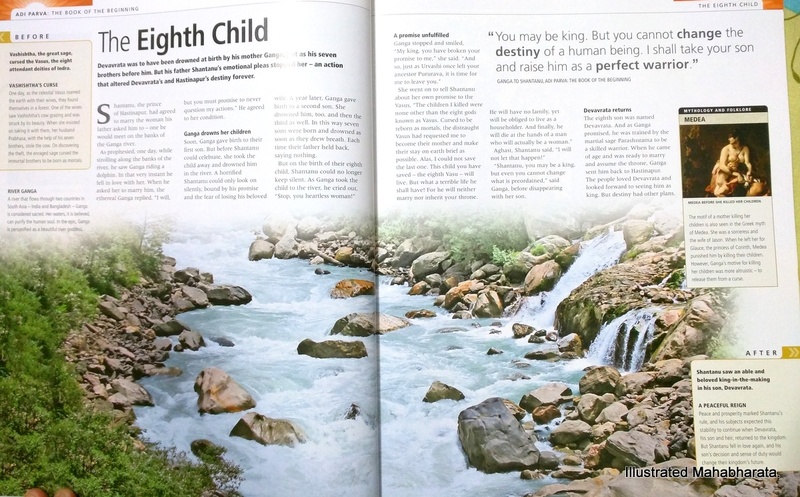 The book, as is common with and often the goal of coffee table books, will invite readers of all ages and levels of interest. 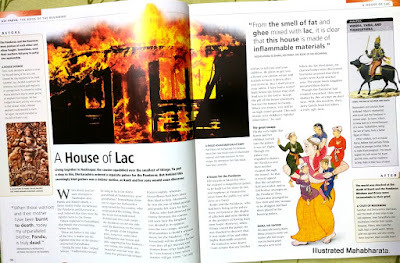 The enticing illustrations are what will invite even young readers to flip through the book. 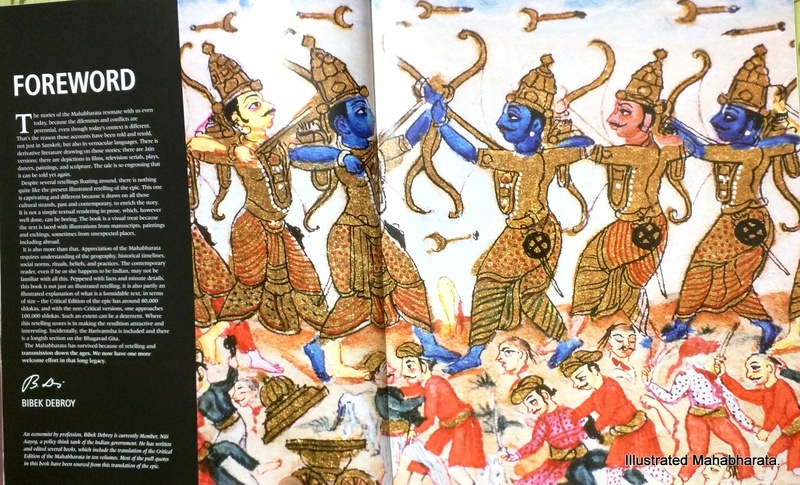 This is the opening that is often needed to draw the new, young, reader into the fascinating world of the Mahabharata. 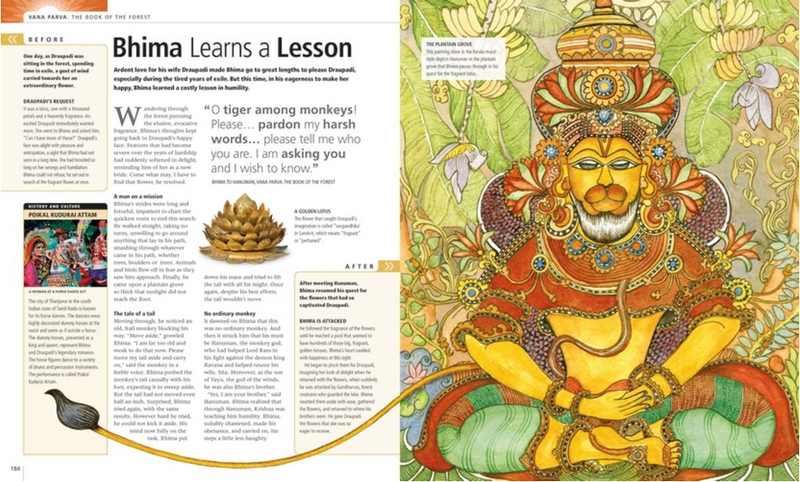 The mainstay of such an approach for decades has been, and still remains, the venerable Amar Chitra Katha series. Do not, however, expect them to be able to understand it on their own. Here is where some adult supervision would be required. Describe to the child the organization of the text into eighteen chapters, and what each chapter covers. Pick a chapter to begin with. 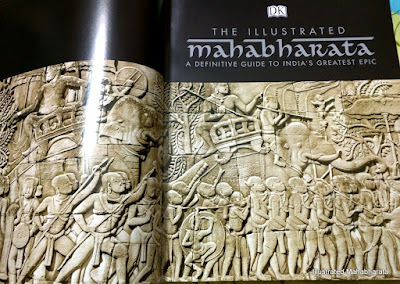 I would suggest Sabha Parva, since it is perhaps the most pivotal of all Parvas in the book, and one with which even young readers of the Mahabharata are likely to be familiar with. If not the Sabha Parva, pick any other of your choice. Read out the basic text with your child, and then let the child explore the other snippets, pull-quotes, illustrations on their own. The book cannot be covered in a day, or a single sitting. Rather, the reader will keep going back to it over days, weeks, and even months. This is where the lay-flat binding helps, but I have already mentioned it, haven't I? Vyasa authored the Mahabharata. Who has written this book? No one, if you go by the book cover. However, that is not strictly true. 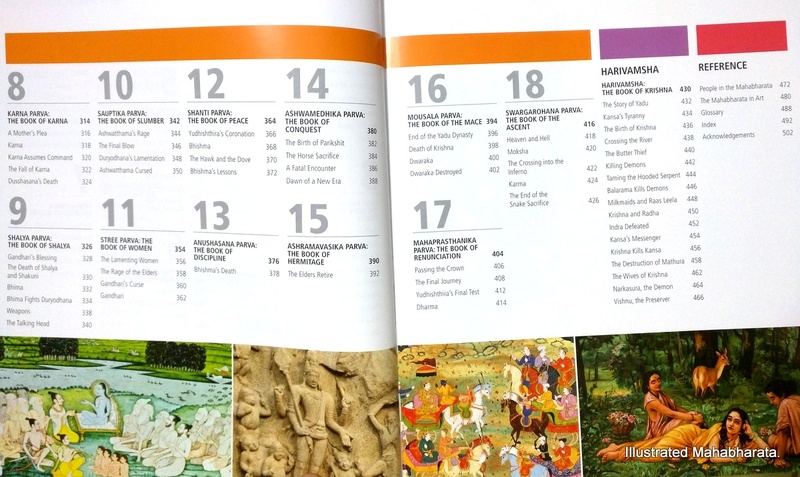 There is a team of designers, illustrators, researchers from the publisher, DK World, that worked on the book and deserve credit for putting together this magnificent end-result. In addition, and importantly enough, it has contributors - Bibek Debroy and Devdutt Pattanaik. Bibek Debroy, as many may know, is an economist, and currently one of three Members of the Niti Aayog (@NITIAayog). More pertinently, he is a Sanskrit scholar and translator of the unabridged, ten-volume Mahabharata. He has also written the foreword to the book. 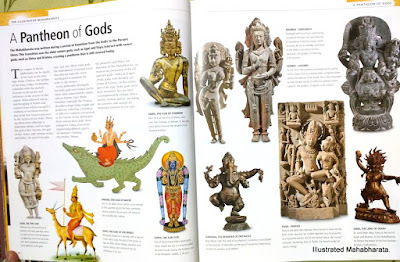 Devdutt Pattanaik is a self-proclaimed mythologist, and best-selling author of several books on Hinduism that are heavily influenced by the Western school of Indology, of which controversial academic Wendy Doniger is among the more famous proponents. The reason I have referred to Devdutt Pattanaik in a somewhat less than flattering light is for a reason. 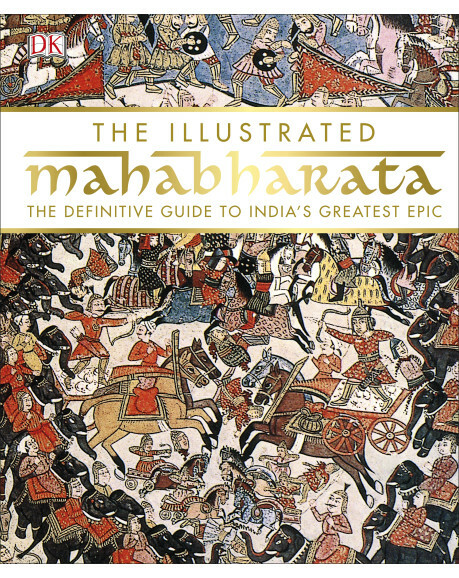 The editors of the book have based their story of the Mahabharata on Devdutt's best-selling abridged adaptation, "Jaya." They have also relied on Bibek Debroy's ten-volume translation of the Mahabharata and of the Harivamsha, apart from David Frawley's (@davidfrawleyved) "Gods, Sages, and Kings", among others. The pull-quotes in the book are almost exclusively sourced from Bibek Debroy's translation. The story in the book, however, is sourced from Devdutt Pattanaik's "Jaya", and this is the source of the only blemish on the book. Devdutt's adaptation is crawling with errors (see this post for a partial list of errors, distortions, and howlers). Whether the episode of Gandhari's aborted fetus, the story of Satyavati, Bhishma's vow, the battle between Parashurama and Bhishma, or the battle at night during the war, there is a deluge of of omissions, distortions, needless embellishments, and outright howlers. These deserves a separate post in itself, which I will put out soon enough. Given Devdutt's obvious hardwork that went into Jaya, why he chose to sully his adaptation with these errors is puzzling, to say the least. 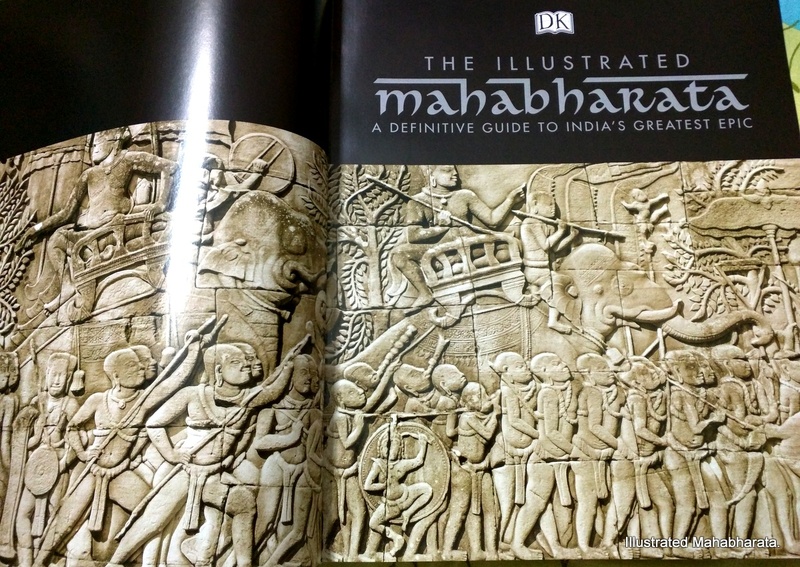 In conclusion, I will still go ahead and recommend this book highly for all, and especially for people interested in a lavishly produced book on the Mahabharata. Despite Devdutt Pattanaik's glaring howlers, this book has a many, many positives going for it. Perhaps the editors would consider putting out a second edition with the dozens of Devdutt's errors corrected, or perhaps source the story from some other, more reliable scholar and author. That would only enhance the timelessness of the book. The book is not cheap, but you can get it for a substantial discount at online retailers, and is well-worth the price.